A digital rebirth - Middle-East website now live! We are Thermaflex, securing smart, and sustainable distribution solutions for heating, cooling and potable water since 1976. Our by nature inspired design for efficiency, durability and recyclability demands a minimum of resources for maximum benefit in respect to energy, economy, environment and quality of life. We work closely together with our stakeholders to develop new innovations that meet the needs of today, and tomorrow. Originally founded in the Netherlands, we have grown as an international player, making a positive impact in over 45 countries. In the Middle-East, we have been active since 1995, securing various referential cooling and chilled water projects in mostly public and industrial markets across Turkey (with an own production facility in Sakarya), Iran, Iraq, Georgia, Azerbaijan, Qatar and United Arab Emirates. Our digital makeover responds to the change we aim to drive today as Thermaflex towards a wholly market-oriented organization, with full focus on the needs of our stakeholders. We strive for a ‘We-conomy’, where we look for smart solutions and innovations in cooperation and co-creation with our stakeholders to maximize benefit for all. Thus arose our ambition to evolve the way we communicate with our stakeholders too.You can discover what makes us tick, the change we seek, and what we (can) do to achieve it. But we don’t just want to inform; we want to inspire, stimulate and connect based on shared values. We are happy to have established a platform that can illustrate this, and foster an exchange of information, inspiration, engagement, and association. The first thing you will find is a much more user-friendly and visually inviting appeal, representing the true values of our brand. We extend that invitation in our clear and open communication, and gladly share our personality with you. We’ve clearly outlined the markets that we serve, the solutions we engineer to do so effectively through smart and sustainable systems, shaped by our universal plug ‘n play components. On top of that, you will find plentiful case studies where we have proven this crucial value. Integrated social media buttons support easy communication of these elements. We also look beyond what we can contribute as a company; at what is happening around us, praise the great things we observe as well as what we would like to see different. 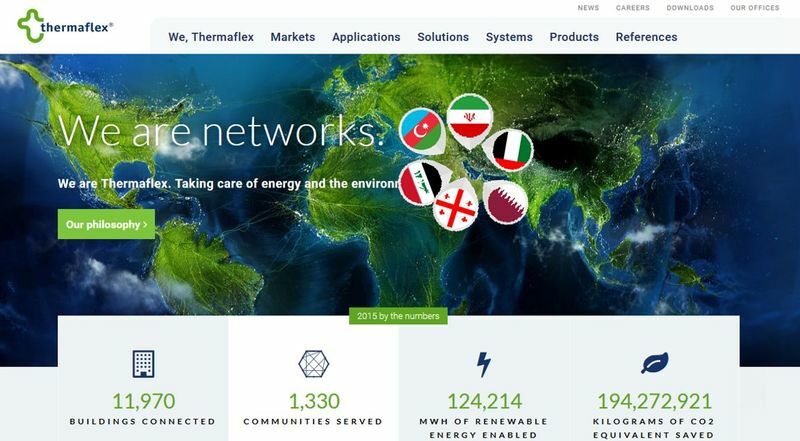 That’s why we’ve just launched our blog: the Thermaflex exchange platform. There you can really get to know and interact with the minds in and around Thermaflex. Feel free to comment! We constantly update our website with articles, blog posts, news items, website modules and case studies. So follow us on our social media to stay up to date! You can experience the new Thermaflex with any computer, tablet or mobile device supported by both iOS and Android technology.